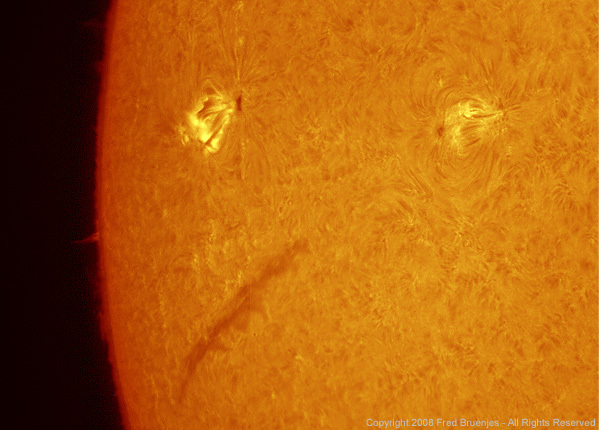 Hydrogen Alpha imagery of the Sun unlike you've ever seen before! 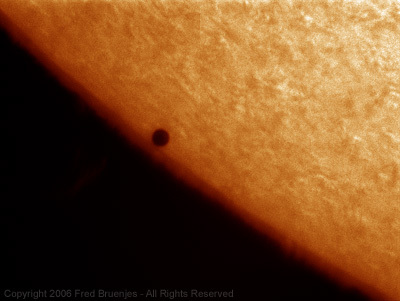 Photos by Fred Bruenjes, using DayStar solar filters and a Moonglow Technologies 2048x2048 15fps Gigabit camera. Click to join the DayStar Filters discussion group. DayStar Calcium Quark through 100mm F15 achromat and Pt Grey BFLY-PGE-23S6M-C camera; 2ms exposure, RegiStax of best 10 frames out of 100. 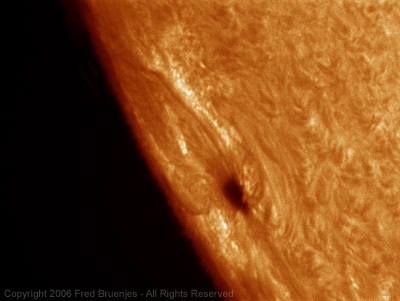 A nice prominence today! 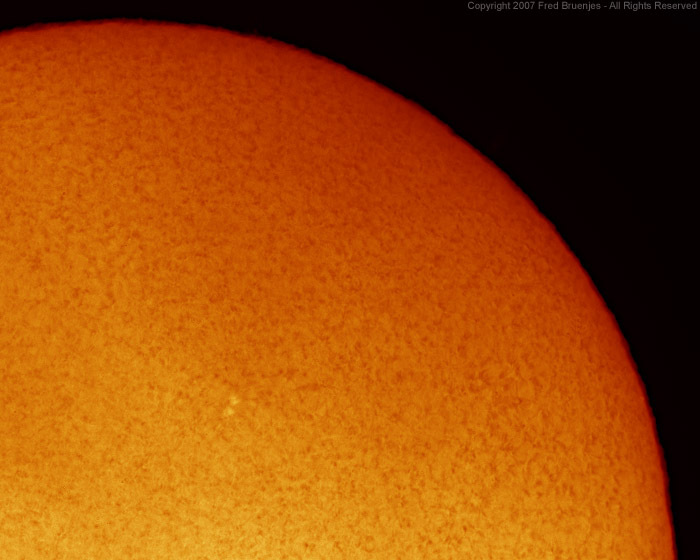 111mm F7 refractor with 0.45� DayStar. Poor seeing. 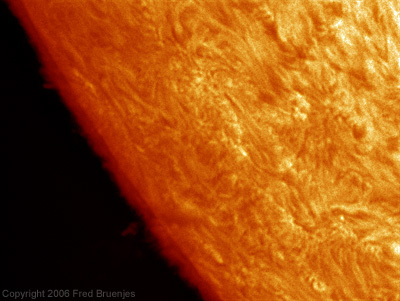 Displayed at NEAF 2010, this high resolution mosaic of the Sun shows prominences and surface in glorious detail. Click on the image below to be taken to a zoomable, full resolution version. 40"x40" (1.0x1.0 meter) high quality prints on photographic paper may be purchased from the ICSTARS web store. 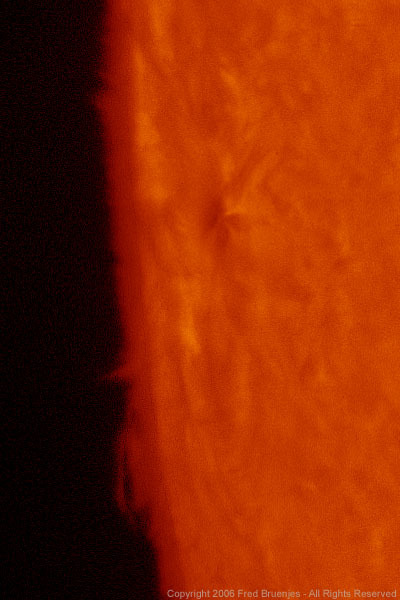 One of the largest prominences in memory has been visible for the past couple days. 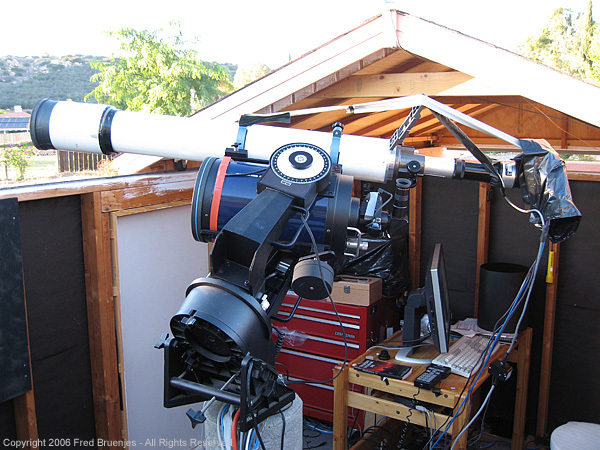 6" F8 refractor with 0.45� DayStar. Good to excellent seeing. Just days after solar minimum was officially declared to have passed, a nice group of activity swung around the limb. 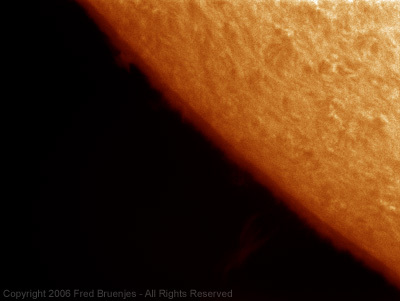 6" F8 refractor with 0.45� DayStar. Excellent seeing. 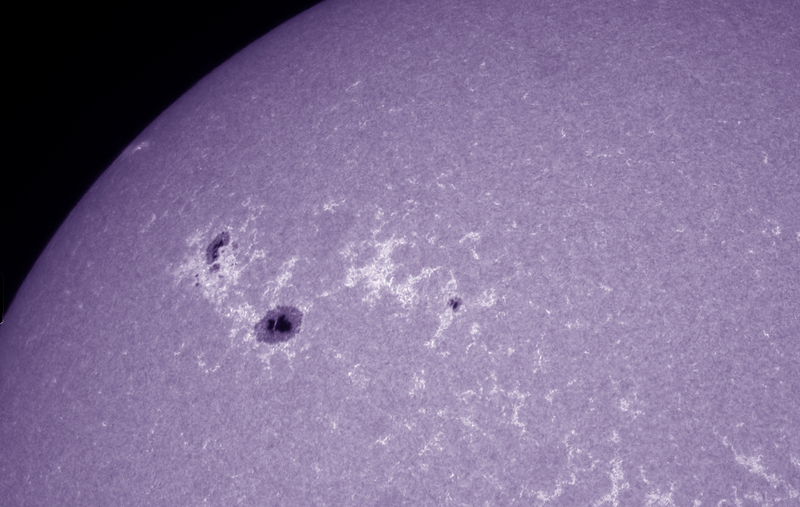 This active region has been sputtering about for a few days. Yesterday I enjoyed watching the field transition arch and filaments wavering about - I could almost see changes in real time visually. 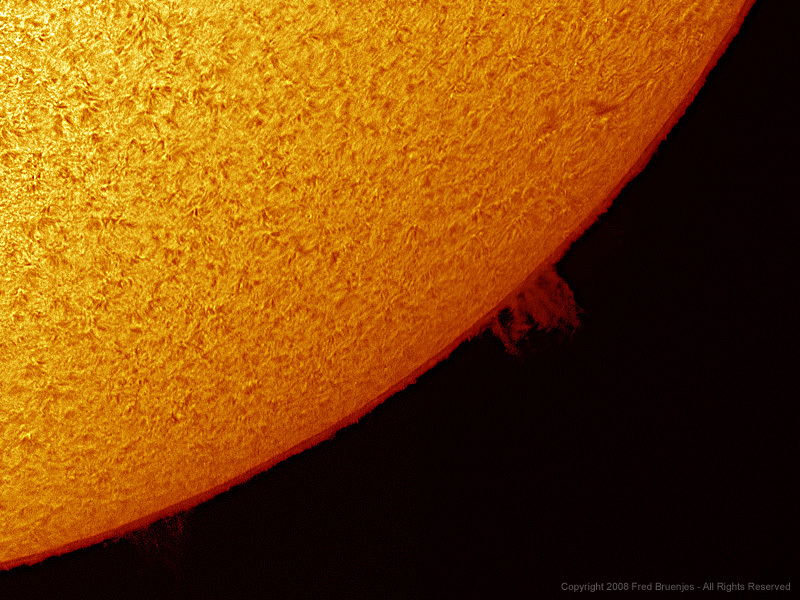 Today I imaged it with a 6" achromat right before sunset (thanks DST!). 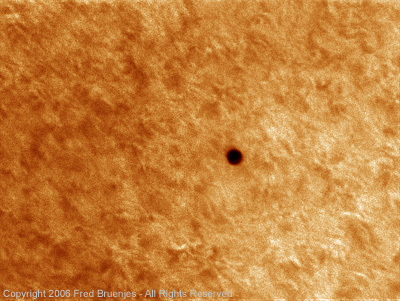 Full disk view of the Sun on November 2, 2008, showing active region 11007 and some prominences. 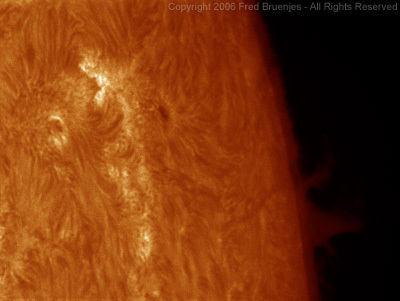 Taken with the new 0.55Å 60mm DayStar SolaREDi that includes a 4x Powermate inside and Moonlite Focuser. 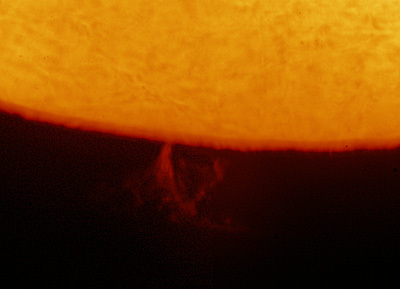 Some nice prominences on the limb today. 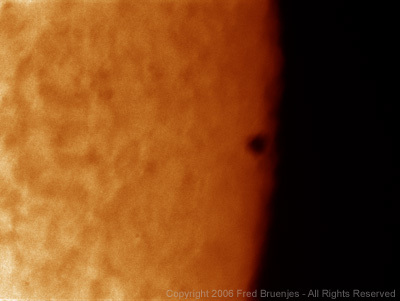 0.45Å DayStar, 6" F8 refractor with 4x Powermate. 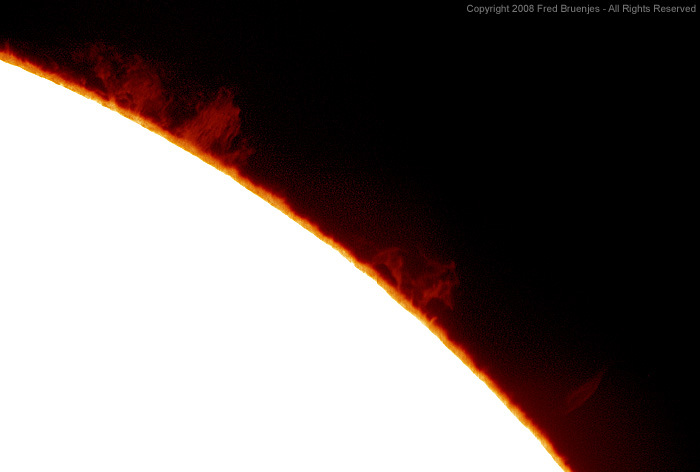 I blew out the surface to give the best detail in the prominences. Average seeing. 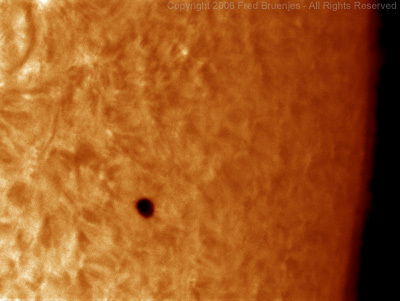 Click here for a 15MB Flash-format time lapse movie of the Solar limb on May 3rd, 2008. 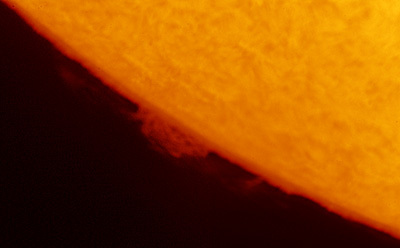 Comprising 190 frames taken at 30 second intervals over 1.6 hours, it shows prominences, dancing spicules, and granulation. Average seeing. 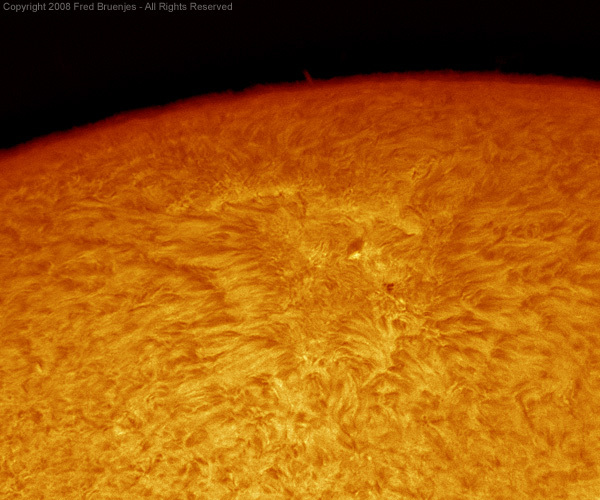 6" F/8 refractor, 4x Powermate, DayStar 0.45Å H-alpha Quantum PE filter, 0.63x focal reducer. Cropped and reduced to 50% of original size. 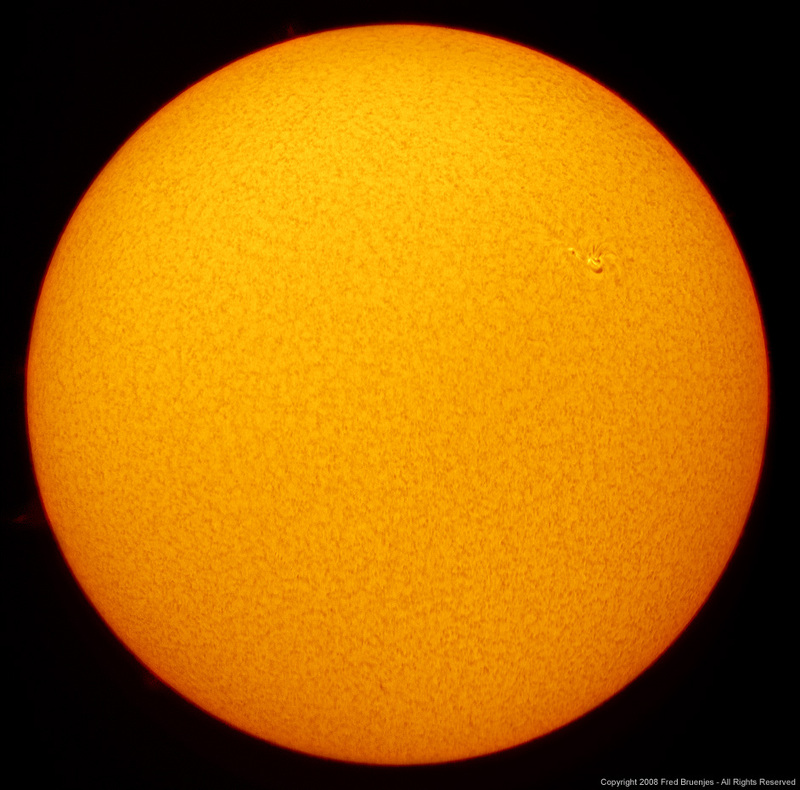 Here are full disk views through the new DayStar SolaREDi 35mm aperture telescope, with a 4x Powermate. Seeing was poor, but this level of activity was worth the effort! 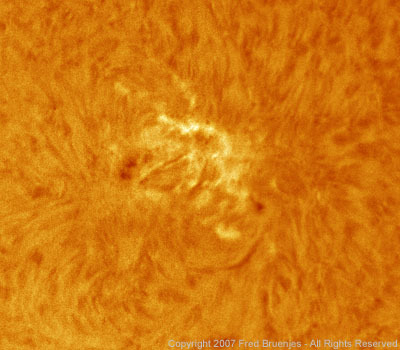 Things are hopping again after a long lull in activity; this is active region 10987 through various filters on a 6" refractor. Poor seeing. 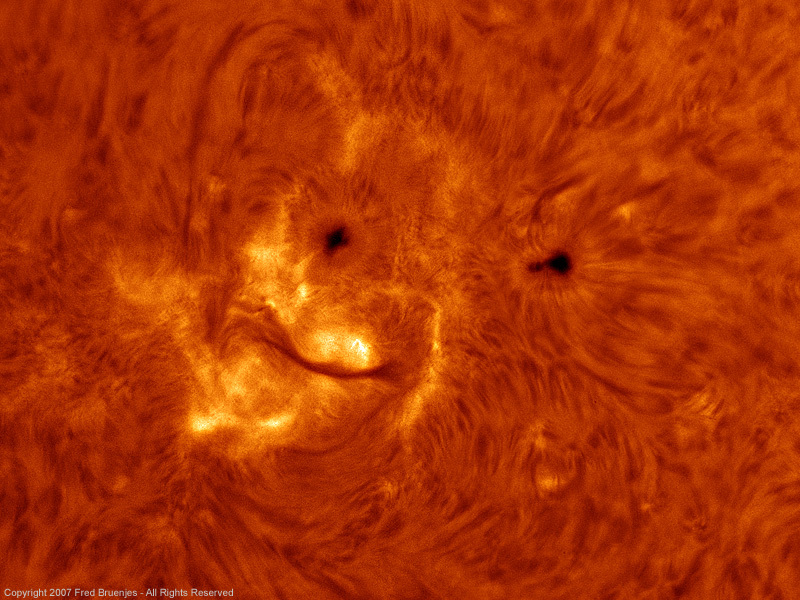 Activity continues in cycle 23... here is active region 10980 which just rotated into view. Celestron C6-RGT 6" refractor, 4x powermate barlow, 0.45Å DayStar, 0.63x focal reducer, Moonglow Technologies prototype camera. North is to the right. Below average seeing. 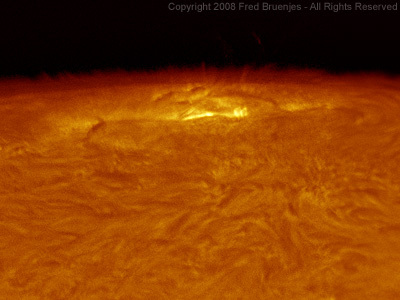 Below is a still frame from a time-lapse movie of active region 10978 on December 17th, 2007. Click on the frame to view the full 3.5MB movie, which is 65 frames taken at 1 minute intervals (for a total time of 65 minutes). The Sun's rotation is evident as a jump in the image height when the movie loops. Full 8" aperture on a day of poor seeing. 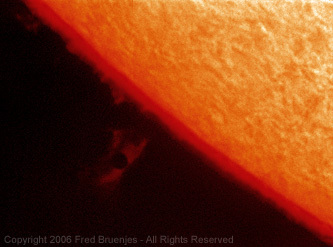 December 13, 2007: Solar Cycle 24 starting? It's a little hard to make out, but dead center is an area of activity with high latitude and reversed polarity, which is the first clear signs of a new solar cycle starting up. Taken with an 8" LX200 SCT off axis, no barlow. Seeing was poor. 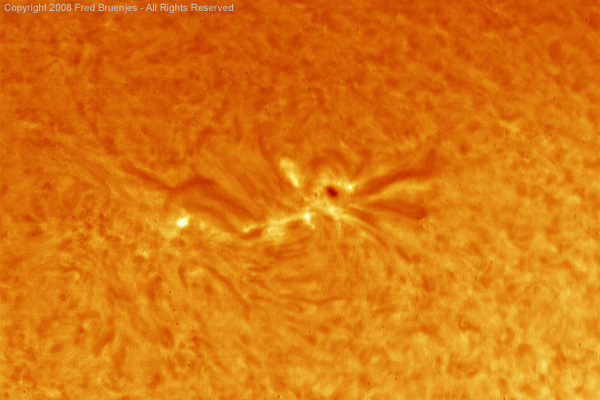 Active region 10978 is one of the most interesting I've seen in months. 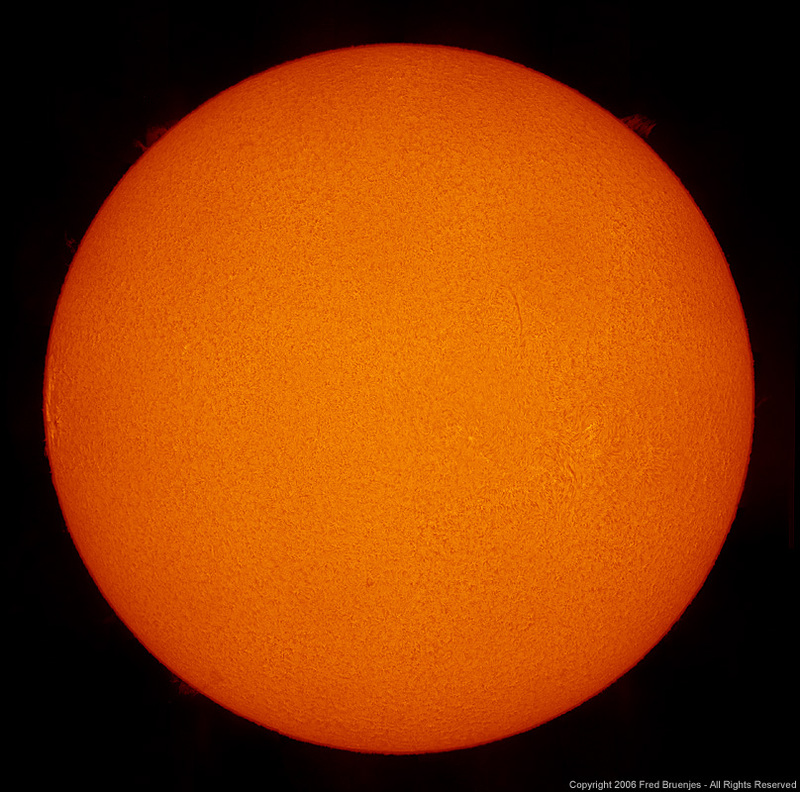 Here's a comparison of the Hydrogen Alpha view at 0.45Å versus a DayStar Calcium II H 5Å. Both images taken with an 8" LX200 SCT off axis, no barlow. Seeing was poor. Things are getting really boring now, as we are near the point of Solar minimum. 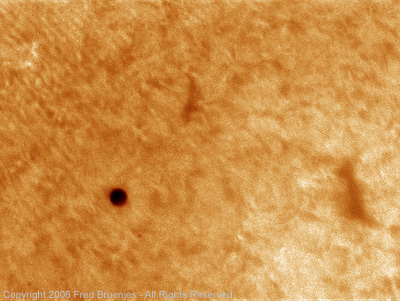 Even a pathetic little active region like this one was "worthy" of imaging. 8" LX200 off axis, no barlow, H-alpha 0.45Å DayStar, poor seeing. 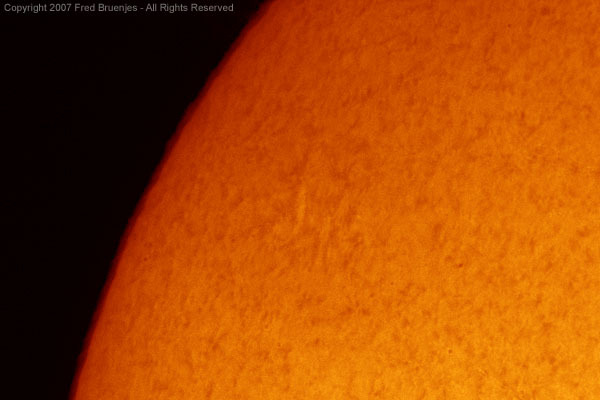 It's near solar minimum and not much is going on, so this active region was a very welcome treat! Full aperture 8", average seeing. 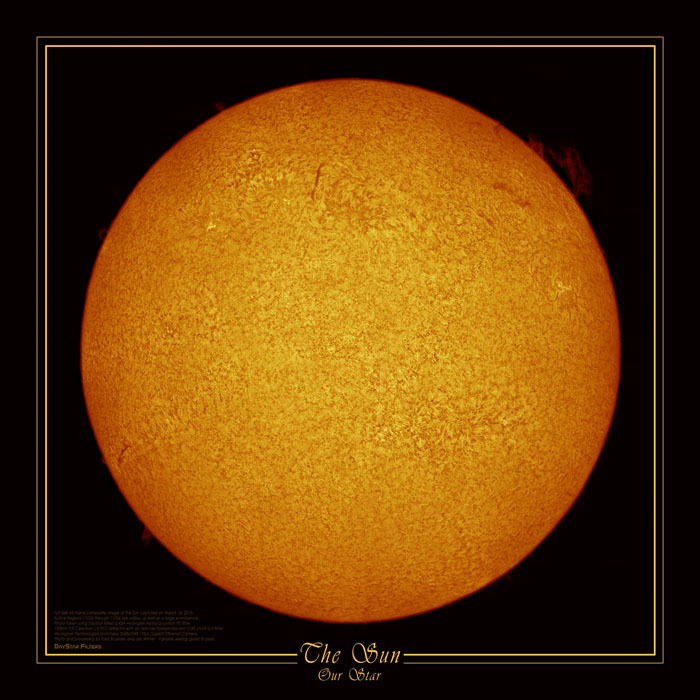 I dragged my equipment up to the RTMC Astronomy Expo on Memorial Day weekend, 2007, to display a live image of the Sun at the DayStar booth. 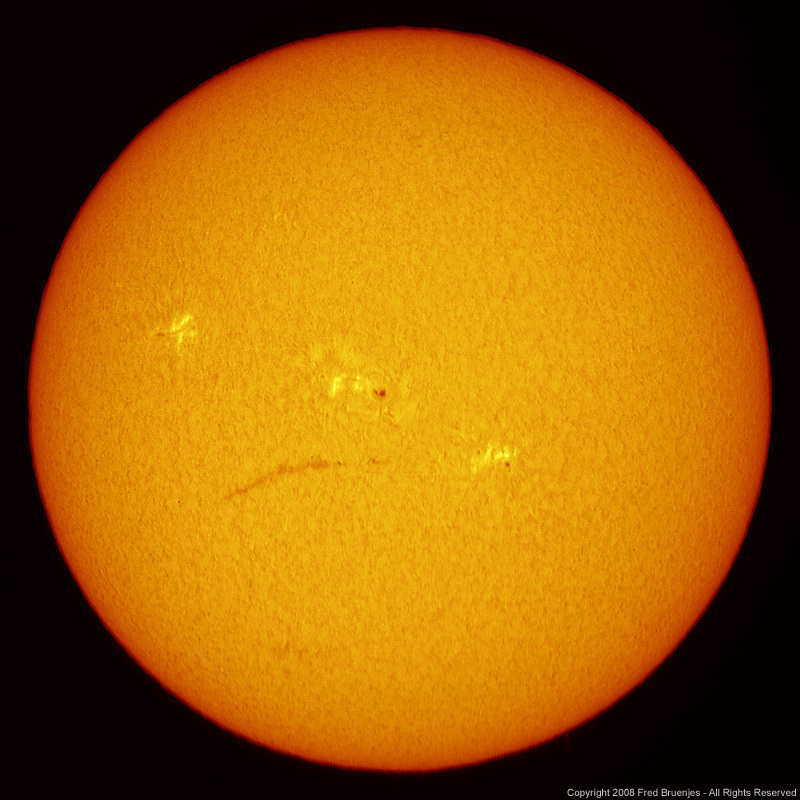 The seeing really wasn't good enough to justify the 8 inch aperture I used, but it was still very fun and we could see many subtle details on the Sun. Below are some random images grabbed from the live display at the booth. 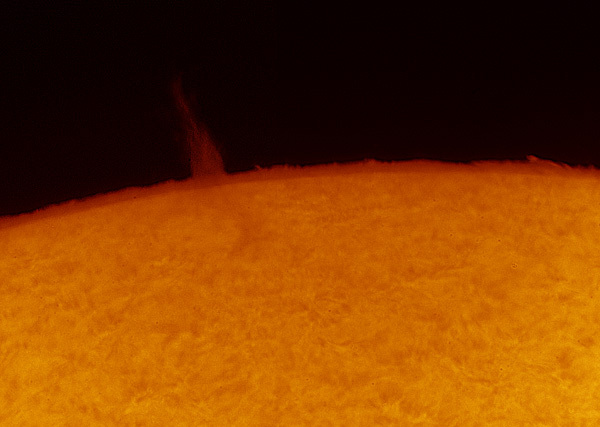 There were no sunspots, so we had to settle for these nice prominences. Technical details: The equipment used was my Meade 8" LX200, a new type of ERF (still being tested and not approved for normal use) that allowed full 8" aperture operation, a 4x Powermate barlow, my 0.45Å DayStar filter, a 0.63x focal reducer, and my custom-built camera. The camera fed the images (2056x2062 pixels, 12fps) over a gigabit ethernet connection to a PC with a flat screen display on the booth table, where they were automatically colorized and displayed in real time. The grabs shown here have been processed in Photoshop to colorize (using levels), some dust specs were cloned out, the full frames were cropped & resized to show the interesting areas, and then an unsharp mask was applied to combat the poor seeing. This full disk H-alpha image is a mosaic of 23 individual frames. The sharpest frames were selected, then composited using PTGui, followed by colorization and sharpening in Photoshop. No stacking nor masking was used. The full res file is over 7000 by 7000 pixels, about two feet square at 300dpi! Gigantic superdetailed 40x40 inch prints (shipped rolled) are for sale for $150, contact me to order. 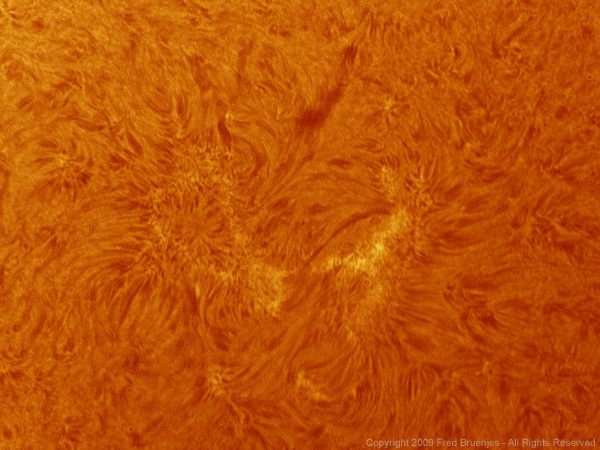 Below is a closeup of active region 10933 at the full resolution of the file. It's a tad noisy since this is a single frame and has been sharpened, but nevertheless it demonstrates the subarcsecond resolution that is possible during good seeing with this equipment. 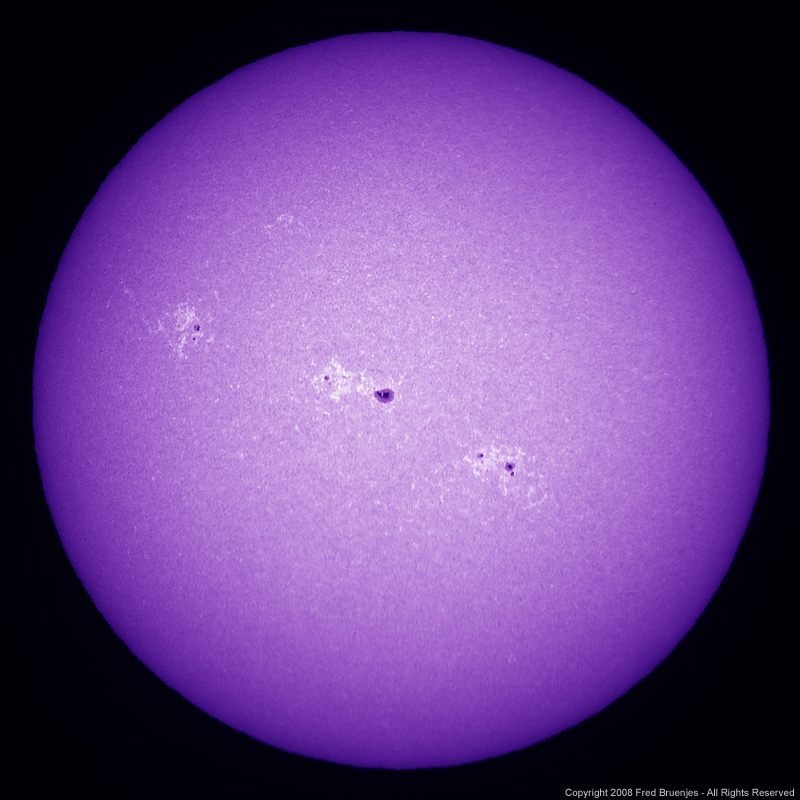 The chromosphere (dark red band to the left of the Sun's surface) is about 6 arcseconds thick. The camera is of my own design, custom built for solar and lunar imaging, and may be commercially offered in the near future. Can you spot it? 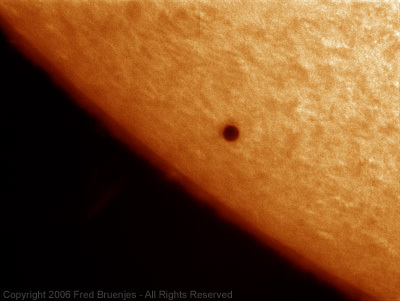 Silhouetted against the prominence! 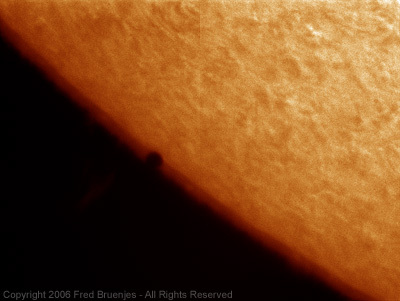 This image has been highly processed to show the prominence, images below are more natural. Mid transit. Atmospheric seeing is worsening as the Sun sinks lower in the sky, so the photos are getting blurrier. Here's the equipment used for today's transit imaging. The optical path is: front aperture red ERF, 5" F8 refractor, 4x powermate, Daystar 0.45Å H-α filter, 0.63x SCT reducer/corrector, camera (based on KAI-0340DM chip), all mounted piggyback on an 8" F10 LX200. Yes, the mounting is VERY unstable and I had a lot of problems with wind shaking the scope. 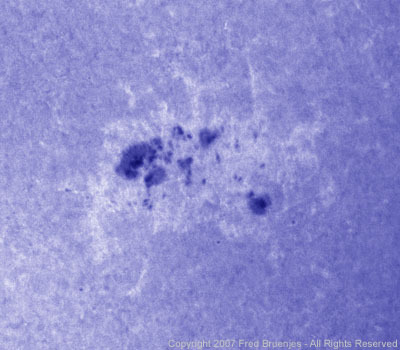 Solar minimum chromosphere taken on September 3, 2006, through a Daystar 0.45Å University Hydrogen-α filter, full aperture 5" F8 refractor with 4x Powermate barlow, and custom built CCD camera. Single frame image, no stacking, no masking, no tricks. Exposure time TBD. All text and images are © 2006-2008 Fred Bruenjes - All Rights Reserved. Image inlining is strictly prohibited. Email for permission before using an image or text.